In short, Pat Shurmur can’t wait until after the Vikings are done playing to interview because by that time, there might not be any head coaching jobs to talk about. Vikings offensive coordinator Pat Shurmur will spend the last three days of this week talking to four teams — the Lions, Cardinals, Bears and Giants — about their head coaching openings. Those interviews come after players leave town for the Vikings’ playoff bye week, and while coaches continue preparations for the team’s three potential opponents (the Rams, Saints and Panthers). That’s led a number of you to ask why Shurmur can’t wait until after the season to interview for head coaching jobs, and whether the time he’s spending on interviews will detract from the Vikings’ game preparation. In light of those questions, it seems like a good idea to spend a little time this morning looking at the situation. In short, Shurmur can’t wait until after the Vikings are done playing to interview because by that time, there might not be any head coaching jobs to talk about. Teams generally want to have new coaches in place by mid-January; the Vikings hired Mike Zimmer on Jan. 15, 2014, at the end of what was considered a long search. It gives new coaches time to familiarize themselves with the organization and get assistant coaches in place before draft preparation begins in earnest with the Senior Bowl at the end of January. And while it’s true the 49ers waited until after the Super Bowl to name Kyle Shanahan their head coach, they’d already conducted a first interview with him during the first weekend of the playoffs, and talked with him again before the Super Bowl. It simply isn’t realistic to expect teams to wait until the end of the playoffs to conduct first interviews with coaching candidates. Doing so would effectively eliminate a set of coaches — coordinators from contending teams — that annually attract plenty of interest. In some ways, it’s actually good for the Vikings to let Shurmur (and possibly defensive coordinator George Edwards) talk to teams about jobs this week. If a Vikings coordinator gets a head coaching job, it speaks well of Mike Zimmer and the team’s program overall (though it might be a stretch to call Shurmur, who’s already been a head coach once, the start of Zimmer’s coaching tree). And Zimmer, who spent years interviewing for head coaching jobs before the Vikings finally hired him, could certainly understand the plight of coaches who want to climb the ladder. Several of you have also asked whether the Vikings could give Shurmur a big enough raise to stay. Even if they made him the highest-paid offensive coordinator in the league, it would likely pale in comparison to what he’d earn as a head coach. And after getting one shot at the top job in Cleveland already, it’s hard to blame the 52-year-old for wanting another shot to head out on his own. He’d certainly be wise to be selective about the job he’d take — especially after working for the Browns — but to expect him to pass up all his opportunities for a pay bump with the Vikings isn’t realistic. The best piece of advice from here would be not to worry too much about Shurmur’s interview schedule. The Vikings have played each of three teams they could face in the second round of the playoffs, beating the Saints and Rams while losing on the road to the Panthers, and while they’ll certainly study all their potential opponents to be ready for a rematch, it’s not as though they’re starting fresh on any of those teams. Shurmur’s offensive assistants will continue working while he’s interviewing, and given how NFL coaches operate, it’s likely Shurmur will squeeze in a fair amount of prep time when he’s not talking to other teams this week. It’s not a perfect system, but for coordinators on playoff teams that have hopes of moving up, the NFL doesn’t really have a better way of making head coaching interviews perfectly compatible with playoff preparations. 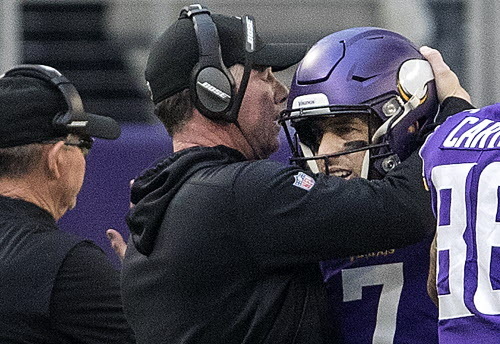 In the end, whether Shurmur talks to other teams won’t be the determining factor in whether the Vikings win on Jan. 14, and as he discusses possible opportunities with other teams in Minnesota later this week, it’s best to keep things in perspective.